The executive order issued by President Muhammad Morsi of the Muslim Brotherhood’s Freedom and Justice Party last Thursday has thrown the country into substantial turmoil, with demonstrations, clashes and civil strikes throughout much of the country. 1. Morsi’s rivals for political power, Amr Moussa, Hamdeen Sabahi and Mohammed Elbaradei, have formed a committee to monitor the situatio, according to Alarabiya television in Arabic. There are some reports that the Muslim Brotherhood is planning to file charges against them (of treason? corruption? ; if so that would be very bad and a big further step toward dictatorship). Leaders of parties such as the Wafd, the Ghad (Tomorrow), the Socialists, and etc., have come out against Morsi’s move. In a political blow to Morsi, his own Justice Minister, Ahmad Makki, said that he agreed with the reservations of jurists about the sweeping character of Morsi’s decree. He said he trusts that the president had good intentions, wanting to move along the drafting of the constitution and the democratic process. Makki will likely play a major role in mediating between Morsi and the enraged judges. The difficulty that the young revolutionaries may have in allying with Egypt’s legal establishment (most of them had been pro-Mubarak) was illustrated Saturday night when they threw out of Tahrir Square the head of the country’s Lawyers’ Guild, who was protesting Morsi but was considered too close to Mubarak for the taste of the other demonstrators. Morsi has a rural power base in the Muslim Brotherhood and among many who voted for him despite not being members of the Brotherhood. But in the Delta there are a number of traditionalist Muslim towns hostile to the Muslim Brotherhood (think of traditionalists as like Catholics and the fundamentalists as more like Protestants). And, his critics are more powerful in the capital itself, and so far during the Arab Upheavals it is the capital that has made the final decision. The controversy centers on Morsi’s attempt to exempt both himself and the originally 100-member constitution-drafting body, the constituent assembly, from judicial review by Egypt’s higher courts. The president says that the constitution will be finished by March 1, and that when it comes into effect he will give up any powers he has assumed in favor of the constitutional ones. 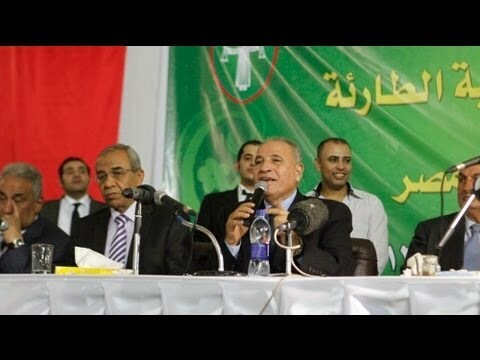 Another issue is his dismissal of the public prosecutor and appointment of a new one, close to the Muslim Brotherhood. But this latter step, while it has angered the legal establishment in Egypt, isn’t where the New Left seems to be making its stand. Although Morsi’s former rival for the presidency, Ahmad Shafiq, maintains that there is no such thing as a temporary dictatorship, there is actually no real reason to doubt that Morsi will submit to the new constitution. As Ellis Goldberg points out, it is to some large extent modeled on the current French constitution, except that the draft actually reduces the president’s powers in favor of the prime minister. And, far from being above the law, the president in the draft constitution can be overruled by a simple majority of both the new senate and the lower house. Judicial officials will name candidates to judgeships, with the president choosing the final awardees of these posts– and while he has wide latitude to choose among the names presented, he is limited by the nominating committee, composed of independent jurists. From Morsi’s point of view, the struggle is over the autonomy of the Constituent Assembly now drafting the constitution, which Morsi appears to have feared might be dissolved by the supreme administrative court (just as it dissolved the elected parliament last fall). Putting the work of the Constituent Assembly beyond the purview of the courts ensures that its Muslim Brotherhood majority can shape the future of the country. What is odd is that I am unaware of any big demonstrations centering on the Constituent Assembly or its draft constitution. How to understand the vehement reaction against Morsi’s executive order? I think it is because, like Shafiq, many Egyptians do not trust him to give back powers once he has acquired them, and so they fear that he is refashioning himself as a dictator. When Morsi took power, he promised not to try to legislate or to impose things on the country, aware that in the absence of a legislature or a constitution, people in Egypt would be touchy about anything that looked high-handed. He has abandoned that earlier caution, most unwisely, and now does look high-handed. Some of his critics fear he plans to reinstate the parliament elected in fall, 2011, which the courts dissolved on the grounds that the Brotherhood and the Salafi Nur Party illegally ran party candidates for independent seats. A Muslim Brotherhood president with a Muslim Brotherhood parliament would place a lot of power in the hands of the fundamentalists, and they would be curbed only by the secular courts and the military, both of which Morsi is attempting to defang– raising the specter of a one-party state.